Heading into Tuesday's game, the Tigers are playing .500 ball with a 9-9 record, sitting in fourth place in the AL Central. It's still only April, so it's far, far, far too early to be watching the standings, but there are a few things we can learn about the team as a whole right now and understand why they're playing mediocre baseball. Even more importantly, we can maybe get an idea of what's going well (and what's not) to see how the future might project. Before you read any further, you have to promise me something, though. Promise me you'll keep a healthy line of separation between what is and what will be. These stats are just a pulse-taking exercise for where things stand currently. The Tigers are doing quite well in the run-scoring department, currenly third in the AL in runs scored per game (4.4 runs, above the league average of 3.9) -- as you would expect from a team that is third in batting average, fifth in slugging, and seventh in on-base percentage. Diving deeper into those numbers, the Tigers are third in the AL in both line-drive rate (22 percent, with Castellanos, Iglesias, and yes, Justin Upton leading the way), as well as hard contact rate (33 percent, led by Saltalamacchia, Victor Martinez, and Miguel Cabrera). The team is the best in the American League at keeping the ball off the ground, at 36.9 percent. Where they need some serious help is in their baserunning and patience at the plate. The Tigers are nearly the worst in the league in stolen base success (50 percent), extra-bases taken (32 percent), and walk rate (6.9 percent). According to Fangraphs' base-running runs statistic, the team is second-to-last with -4.1 runs. J.D Martinez, Ian Kinsler, Anthony Gose, Nick Castellanos, Jose Iglesias, Victor Martinez, and Miguel Cabrera alone combine for -4.9 base-running runs. The team is currently ninth (out of 15 teams) in extra-base hit percentage, and this is where we have room for hope. As Miguel Cabrera and Justin Upton begin to heat up, that number will climb -- the large number of line drives and the high hard-contact rates suggest an improvement sooner rather than later. If they want to capitalize on that, they'll need to get the walk rate up -- Nick Castellanos and Ian Kinsler are currently sitting at around a 3 percent. The team's starting pitching currently ranks 11th out of 15 for both ERA and FIP (fielding-independent pitching). Mike Pelfrey and Anibal Sanchez, unsurprisingly, are the worst offenders with a 6.21 and a 5.74 FIP, respectively. Expect Pelfrey's numbers to go down as he gets his command under control. A big part of those high FIP numbers is due to the starting rotation's high walk rate, which is currently the highest in the American League at 4.3 walks per nine innings. Mike Pelfrey is once again the major culprit with 7.4 walks-per-nine, but this is a temporary anomaly. His career average is 3.2 walks in a nine inning span, so it would be unrealistic to think he'll continue to post numbers more than double that. Another reason for the inflated FIP and ERA numbers has to do with the starting rotation only striking out 7.3 batters per nine innings, the fifth-lowest in the league. Justin Verlander and Anibal Sanchez are among the highest, at 9.6 and 8.5 respectively, but Jordan Zimmermann's 5.5 rate and Mike Pelfrey's 4.9 rate drag the overall numbers down. Neither are typically high strikeout pitchers, but Zimmermann at least should get closer to his 7.4 career average. What will help get the strikeout numbers up, and all the other bad numbers down? Throwing more strikes. The starting rotation is the fifth-lowest in the league for both percentage of strikes thrown (61.7 percent), as well as inducing whiffs (8.7 percent). The Tigers finally have a decent bullpen, K-Rod's volatility notwithstanding. It's not an elite bullpen, but it's at least average, if not better in some categories. The bullpen also has the highest batting-average-on-balls-in-play (BABIP), despite having the sixth-lowest hard contact rate in the league. The average BABIP for American League bullpens is about .270, so some regression to the mean is probably in order. Like the starting rotation, the bullpen is dead last in strikeouts and whiff rate (5.9 strikeouts per nine innings, 62.9 percent swing-and-miss rate), despite some stellar work by Justin Wilson and Alex Wilson. Justin Wilson has a K/9 rate of 11.9 and a whiff rate of 12.1 percent, while Alex Wilson has a K/9 rate of 9, and a whiff rate of 13.3 percent. As Alex Wilson gets more innings, expect those overall bullpen numbers to improve. What the bullpen is doing right is keeping the walks out of the equation. The team has the fifth-best walks-per-nine rate at 2.5, and there's quite a bit of inflation there from K-Rod's personal 5.7 walks-per-nine performance. His career rate is 3.6, and in his last two seasons combined it was 2.1, so he will almost certainly improve that number and bring the team totals into the top three or four in the league. The offense is fine, and can get even better with a few more walks and some better baserunning skills. The starting rotation is struggling, but Mike Pelfrey is due for some improvements that will get that rotation looking a lot better. The bullpen is average-to-above-average, and K-Rod is bound to sharpen things up and put that relief corp firmly in the Above Average category. 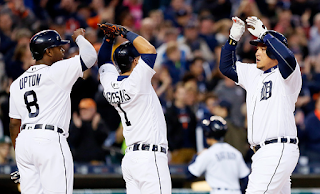 The Tigers are playing mediocre baseball right now, and the numbers support that. But this is hardly the final chapter for a team that is currently underperforming against their level of talent.